The third-party online payment market continued to grow rapidly in 2012,with the large-scale annual transaction exceeding 3.8 trillion yuan, according to the latest data from Enfodesk. The third-party Internet payment market share in 2012 remained stable. According to Enfodesk, Baidu accounted for 30.9% of the total online ad revenue in China; Alibaba for 15.3%, and Google China for 6.2%. According to iResearch on the major entry and exit websites of the past two years, Chinese netizens’ behavior did not change too much. Portal, search engine and navigational websites are still the main choices for netizens to surf the Internet. The continued online user behavior research released by iResearch showed that, Tencent QQ reached over 200 million in January 2013, which is 71.5% of the total netizen maintaining the lead in instant messaging market. Followed by Aliwangwang and Fetion. Aliwangwang reached 44.09 million internet users while Fetion reached 17.99 million. According to China search engine market quarterly data in 2012 released by EnfoDesk, the China search engine leader Baidu accounted for 78.6% of the total search engine market, Google for 15.6%, while Sogou 3.1%. Recently Hitwise collected data of anonima internet surfing, searching and interbehavior among netizens, cooperated with the telecoms operators and the ISP. 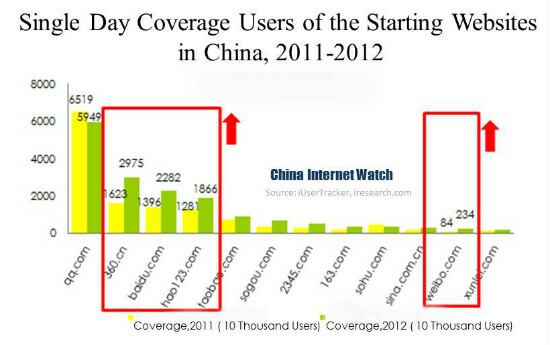 They found that Wiki sites, the local catering industry, tourism and the Airlines have higher dependence on Baidu.